George Kelly (1963) has been called the father of cognitive psychotherapy along with Aaron Beck, Albert Ellis, maybe the Greek philosopher Epictetus, who in the first century AD said it is not the event itself that determines our behavior but how we perceive the event, and even Evagrius, the fourth century monk who cataloged eight logismoi ,a combination of thoughts and passions, which were later condensed into the Seven Capital Sins. How this paternity suit will be settled is not clear but, at least, Kelly is named as one of the fathers. He developed his theory of personality and therapy in the middle of Kansas (where he was born) and in the middle of Ohio (where he taught at Ohio State) rather independently of other systems such as psychoanalysis and behaviorism. Kelly falls into the modernist correspondence tradition of critical realism which states we are continually updating our constructs or schemas or maps to approximate reality. As scientists we revise our hypotheses to fit the data. The postmodernist constructivist tradition, in contrast, says we can only be aware of the world as it appears in our mind (phenomena), not the world as it is in itself (noumena). So we create our world rather than discover the world. As artists we fashion a world congenial to our liking. Kelly lays out his theory with a fundamental postulate and a set of corollaries that approximate unintelligibility. However when his logical English is translated into conversational English, it makes a lot of sense. For example his Fundamental Postulate starts with the premise: “A person’s processes are psychologically channelized by the ways in which he or she anticipates events.” Say what? Translation: our behavior and thoughts are guided in certain directions by the personal constructs used to predict future events. Personality is the collection of constructs that constitute a person’s construct system at any given time. We are the way we construe ourselves, our relations to others, and our relations to the world. We look for repetitions around us and then formulate constructs or representations to map our world. The mind looks for order and then imposes that order in the form of templates on our experiences and the world. Like scientists we develop theories and hypotheses that will help predict future events, thus reducing uncertainty. We then run experiments to test our hypotheses. If our predictions about reality are confirmed, the construct is useful and we use it again. If it is not confirmed, the construct is revised or abandoned. Or, if we’re neurotic — that is, a poor scientist — we keep it anyway. I’d like to go through a few of Kelly’s corollaries and trace how they show up in the Enneagram styles. I’ve done some of this in my book Nine Lenses on the World, the Enneagram Perspective (2010). I leave it to the reader to decide whether, in linking Kelly and the Enneagram, I am approximating reality in the correspondence tradition or just making it up in the constructivist tradition. Kelly begins with his corollary of Constructive Alternativism. We are free to construe reality any way we wish, but then we are determined by our belief system. We’re not stuck with our hypotheses or the way we are. We can change our belief system; but once inside our construct system we are constrained by the rules of that particular paradigm. So if you believe the world is flat, when you come up to the edge of your world, you will stop and pull back. If you believe the earth is round, you can keep going without fear of falling off. TWOS say they find it impossible to make demands on people, because they are supposed to give and not to ask. EIGHTS, on the other hand, have little difficulty demanding what is their due — or even what’s not their due, for that matter. They take because their precept says don’t be taken. THREES say they just can’t expect things to happen; they have to get organized and get going. “Don’t just stand there, do something.” Their rules say: work as efficiently as you can. NINES say they prefer to just let things happen. “Don’t just do something, stand there.” Their instructions say: expend as little energy as possible. FOURS find it unthinkable to be plain and ordinary. Their paradigm says they have to be distinctive and unique. It’s no big deal to NINES. Their norms tell them to lay low and not stand out. FIVES say they find it difficult to connect with and express their feelings. They also don’t see much logic or value in doing so. Their paradigm directs them to their head. FIVES are clear thinkers but vague feelers. FOURS find it difficult to detach from their feelings and can’t imagine life being worthwhile without them. TWOS also have no trouble feeling but would like to think straight. Their paradigms lead them to their hearts. SIXES find it difficult and dangerous to relax or take their mind off their problems. Their rules say: “Don’t get caught off guard or blind-sided.” NINES prefer not to look at their problems. Their paradigm says: “The problem will go away if you don’t give it any energy.” SEVENS say “What problems?” because their strategy is to find the positive in the problematic. SEVENS can’t do only one thing for a long period of time because their paradigm says: “Keep your options open, don’t get tied down, and avoid being bored.” SIXES and ONES prefer to work single-mindedly because their guidelines work best with routines and set procedures. EIGHTS and COUNTER-PHOBIC SIXES won’t show their vulnerability lest you hurt them. Their strategy is to be tough and independent. PHOBIC SIXES expose their vulnerability and weakness so you won’t feel threatened by them or hurt them. Their approach is to be dependent. Kelly’s Commonality Corollary states that: “To the extent that one person employs a construction of experience which is similar to that employed by another, his psychological processes are similar to the other person.” So it is not common experiences that make people similar but the fact that they construe their experiences in a similar way. 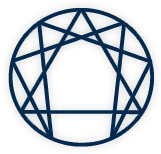 The nine Enneagram types share the commonality that they tend to construe or interpret experience in a way that is similar to their fellow Enneatypes. Eights share a common world view that differs from the worldview of, say, Twos. Thomas Kuhn (1996) writes about paradigms and science. What he says about scientists accords remarkably well with Enneagram types. Science, he proposes, is a very subjective enterprise. Most researchers (Enneagram types) share a common set of assumptions or beliefs about their subject matter. In Kuhn’s view a paradigm is “the entire constellation of beliefs, values, and techniques shared by the members of a given scientific community (Enneagram style).” For those scientists (Enneagram types) accepting a given paradigm, it becomes the way of looking at and analyzing the subject matter of their science. Once a paradigm is accepted, the activities of those accepting it become a matter of exploring the implications of that paradigm. While following a paradigm, scientists (Enneagram styles) explore in depth the problems defined by the paradigm and utilize the methods suggested by the paradigm while exploring those problems. According to Kuhn there are rules that limit both the nature of acceptable solutions and the steps by which they are to be obtained. Although a paradigm restricts the range of phenomena scientists (Enneagram types) examine, it does guarantee that certain phenomena are studied thoroughly, namely those the paradigm focuses on. But this might blind scientists (Enneagram types) to other phenomena and perhaps better explanations for what they are studying. A paradigm, then, determines what constitutes a research problem and how the solution to that problem is sought. For example, a psychoanalytic paradigm would instruct its practitioners to look inside the person for long-ago, deep-seated conflicts that need to be understood and felt; while a behavioral paradigm would have its adherents look outside the person to discover what reinforcers in the present environment are maintaining the person’s behaviors. While psychoanalysts are perfecting their paradigm, they might overlook what’s happening now. And while behaviorists are refining their paradigm, they might miss or be forbidden to consider what’s going on inside the person. Both could use a bigger paradigm – which is what integrative approaches to psychotherapy are concocting. Enneagram styles share a common paradigm that tells them what to look for. What is important to you? What do you value? 1. What’s right and what’s wrong? 2. What do others need? Who needs what? 3. What will work and what will be successful? 4. What’s unique and what is missing? 5. What’s the big picture and where are the connections? 6. What can go wrong and where is the exit? 7. What can go right and what are the options? 8. Who has the power and who has the leverage? 9. Where is the harmony and where is the consensus? Each Enneagram style or paradigm also cautions what to look out for. What might touch the vulnerability or sensitivity of the style? Each of the Enneagram paradigms specifies what the problem is and what to do about it. The problem is you, others, and the world are imperfect. The solution is critique and fix them. The problem is you’re not needed nor appreciated enough and the world is needy. The solution is love more. The problem is you’re not admired enough and the world is inefficient. The solution is keep working and moving. The problem is the world is ugly and abandoning. The solution is make the more beautiful and yourself more special. The problem is the world is intrusive and withholding and it doesn’t make much sense. The solution is hide out and try to understand it. The problem is the world is dangerous and unpredictable. The solution is make laws to regulate it and find an authority to enforce them. Or be wary of the world and authorities. The problem is the world can be limiting, dark, and painful. The solution is find options, lighten things up, and seek pleasure. The problem is the world is hostile and unfair. The solution is get them before they get you and enforce your justice on the world. The problem is the world is conflicted and neglecting. The solution is calm it down and settle for what you can get. Kelly’s Individuality Corollary states that: “Persons differ from each other in their construction of events.” We are free to construe events as we wish. And how we construe the world is what makes each person unique. So each person within each Enneagram style is going to make sense of the world in her and his own unique way. We are all different, as Fours are want to remind us. In short we have some things in common with everyone: we all make interpretations of the world; everyone has a construct system. We have some things in common with some other people: different types construe or interpret the world in a similar way. We have some things in common with no one: each individual has his or her own unique construct system. A construct has a Range of Convenience which includes all the events to which the construct is relevant. No construct is infinitely useful. All have their boundaries. The range of convenience of a construct like “height” does not include weight, temperature, gender, age, etc. Each Enneagram style has a range of convenience within which it can predict and control certain realities quite well. Outside the range of convenience of the style, things get a little fuzzy and awkward. For example the Range of Convenience of the Five’s paradigm is really good for intellectual ideas, comprehensive systems, and objective analysis but feelings and sensations might fall outside the range of their paradigm and so they need to employ another paradigm, like the Two’s or Four’s, or One’s, for example, to take into account their own and others, feelings and gut reactions. The range of convenience for the One’s paradigm may involve serious things but might not be so useful for playful things. When it’s time to have fun, the One might want to get inside the Seven’s paradigm and indulge in a little divergent thinking instead of convergent thinking. The Eight’s paradigm covers the tough territory. They might want to try on the Two’s paradigm when they are in tender terrain. The Nine’s paradigm prepares them to be calm, relaxed, comfortable, and open to the flow. To get out of the starting gate quickly and head determinedly toward the finish line, they might profit more from the Three’s paradigm to focus their goal and get them to it efficiently and quickly. The Three’s pragmatic, utilitarian paradigm helps them consider whatever it takes to win. The Six’s paradigm might keep them within the law and bring in considerations of loyalty and commitment. The Six’s paradigm prepares them for the worst case scenario. Their paradigm covers what can go wrong. They could use the Nine’s paradigm to live with the worst, or the Seven’s paradigm to imagine the best. The Four’s paradigm covers the tragic side of life: suffering, disappointment, death. The Seven’s paradigm takes in the comedic side of life: joy, life, satisfaction. If the rules and range of convenience of your paradigm or Enneagram style don’t solve your problems or meet all your needs, try the paradigm of another style. The solution might be found there. What’s difficult or almost impossible to do within your paradigm might be relatively easy for another paradigm. We’re free to change constructs and paradigms. As Einstein said, you can’t solve a problem using the same paradigm that created the problem in the first place. And sometimes the solution of our Enneagram style itself becomes the problem. So Fours might solve their problem of fearing being misunderstood by being aloof. But then they leave themselves open to being left behind and abandoned. Their solution brings about the very situation they really fear the most. A construct also has a Focus of Convenience where the construct is maximally pertinent. Each Enneagram style has a particular focus of attention that gives them an intuitive edge. Each style sees some things clearly and more quickly than other styles because they are practiced in scanning for certain things. Experts know what they’re looking for. That’s why we go to specialists. Think about what you look for when you enter a room. ONES notice flaws, imperfections, and what’s wrong, when they enter a room. ONES will give you the right word as you’re fumbling to say something. FOURS pick up rejection, disapproval, and being abandoned before anyone else senses this. They will also be attuned to the aesthetics of the room and the feeling tone of the group gathered in the room, being particularly sensitive to any suffering in the room. If there is any hidden feeling or communication between you and them, FOURS will intuit it. FIVES will sense any expectations and demands put on them or any subtle intrusions or invasions of their space more acutely than others will. As you are about to ask for volunteers for your project, you will become aware that the FIVES have left the building. EIGHTS will sense who has power in the room, those they may have to deal with as competitors for taking over the room. If they sense a vacuum of power, authority, or safety in the room, they immediately move to take control so they feel secure. As you are about to take charge, you may find yourself being relegated to the back of the hall by an EIGHT. NINES can merge with people in the room and sense what it is like to be inside the skin of the other person. They easily empathize with others’ experience. This gives them an intuitive grasp of others’ needs, wants, thoughts, etc. They can also sense harmony, when things are fitting together, as well as disharmony, where there is conflict. But as the level of conflict in the room rises, the level of NINES’ awareness drops, occasionally to the point of falling sleep. Kelly’s Dichotomy Corollary states that: “a person’s construction system is composed of a finite number of dichotomous constructs.” All constructs are bipolar. You can’t know tall without short. Jung’s liking for polarities fits in here. Following are some dichotomies that Enneagram types might employ. We can get stuck in our bi-polar framework or constructs when we evaluate situations. It might be helpful to use a dichotomy from another style and see if that frees us up to make different choices. An Eight, assessing whether this choice will make me look weak or strong, might inquire: “Will this option lead to something meaningful or trivial,” like a Four might ask. Next time you’re considering your options, notice which dichotomies you use to frame your decision. Try using someone else’s dichotomy and see if that frees up your decision-making process. Kelly’s Organization Corollary states that “each person characteristically evolves, for his or her convenience in anticipating events, a construction system embracing ordinal relationships between constructs.” The answer to that “Say what?” question is: people differ in how they organize their constructs in order to reduce contradictions and increase their predictive efficiency. Personal constructs are arranged in a hierarchy, some being more comprehensive than others. There are superordinate and subordinate constructs. For example good-bad might subsume intelligent-stupid in the Ones’ hierarchy while intelligent-stupid would subsume good-bad in the Fives’ hierarchy. Ones will have at the top of their hierarchy whether something is right or wrong and at the bottom whether it is pleasurable or painful. This likely would be reversed in the Sevens’ hierarchy. Nines might have at the top of their pecking order whether something is agreeable or argumentative and may have toward the bottom whether it is beautiful or ugly which Fours would have at the top. Eights would have independent-dependent at the top of their hierarchy while safe-dangerous would be at the bottom in contrast to Sixes who are likely to have that construct at the top. Twos are likely to have generous-selfish at the top of their hierarchy while reasonable-unreasonable might be at the bottom. You would find this construct atop the Five’s hierarchy. Authentic-inauthentic could be the Fours’ superordinate construct while efficient-inefficient would be subordinate. The reverse might be true for the Three’s construction system. To determine what is your most basic construct, keep asking yourself why is this construct so important to you? When you run out of answers, you may have hit the bottom line. Neimeyer (1985) used the example of a woman who described herself as “businesslike” as opposed to”emotional.” When asked why she chose to be viewed as business like, she said she regarded it as a “mature approach to life” as opposed to an “unstable” one. When asked why mature, she said it meant “being in control” as opposed to “being controlled by others.” When asked why it was important to be in control, she answered her very “survival” depended on it and the opposite of that was “death.” That’s about as bottom line as you can get. You might try playing around with and rearranging your hierarchy and notice what changes that makes. It might give you a new perspective. On the note of playing around, I’d like to end by mentioning Kelly’s technique of fixed-role therapy. Early on in his career, Kelly coached dramatics in a junior college (in the middle of Iowa this time). Later, as a therapist, he presented his clients with a personality sketch and asked them to act it out, just as an actor or actress would play a part in a play. To enhance the development of new constructs, the personality of the person the client was asked to play was markedly different from the client’s own personality. So for a week or so, the client was instructed to act “as if” she were the person in the role she was playing. Kelly suggested that neurotics have lost their ability to make-believe while healthy people make-believe all the time. So in the spirit of healthy integration, write out your description of an Enneagram style you would like to emulate, pretend you are that type, and spend a week trying on that role. Then try on another style. At the end of your experiments, you will have nine different outfits to wear and nine perspectives on the world. Kelly, G.A. (1963). A theory of personality: The psychology of personal constructs. New York: Norton. Kuhn, T.S. (1996). The structure of scientific revolutions (3rd ed.). Chicago: University of Chicago Press. Neimeyer, R.A. (1985). Personal constructs in clinical practice. In P.C. Kendall (Ed), Advances in cognitive-behavioral research and therapy. (Vol. 4, pp.275-339). New York: Academic Press. Wagner, J.P. (2010). Nine lenses on the world: The Enneagram perspective. Evanston: NineLens Press.